With the ECB today confirming that its bond purchase program will end in less than three weeks, it is worth reminding readers that the world is now crossing that critical threshold where the consolidated global central bank balance sheet is shifting from a source of liquidity to a drain on the global (and fungible) monetary system. 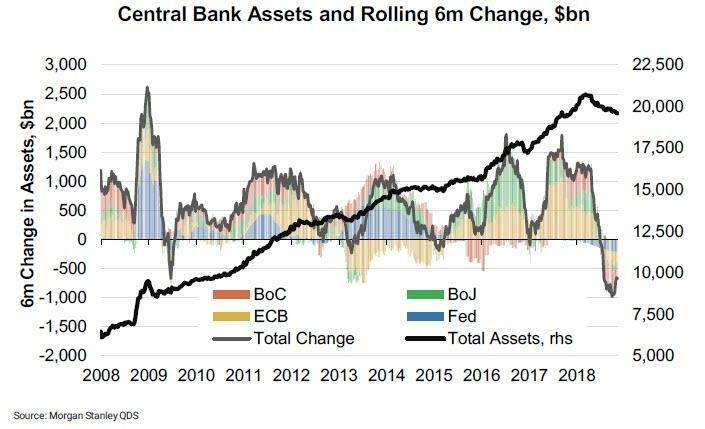 And as the chart below shows, every single time the total change in net central bank assets has dipped into the red, it lasted only briefly before some financial crisis typically ensued, forcing central banks to resume liquidity injections to maintain market stability. Yet while much of the investing public appears to have forgotten about the danger from balance sheet shrinkage, instead focusing on such interim distractions as trade war, peak earnings or rising rates, it is only a matter of time before the need for continued "flow" (not "stock)" of liquidity manifests itself in sharply lower asset prices. Confirming this, is a new note by Nedbank, whose analysts Neels Heyneke and Mehul Daya warn that "equity markets are vulnerable" and caution that "it is time for central banks or governments to step up to the plate to help these markets" reminding readers that "in 2008, the Fed underestimated the size of the shadow-banking system, and the rest is history." To underscore this point, the analyst duo shows the following key chart which makes it unambiguously clear that there is a strong relationship between the change in global USD-liquidity (in the form of M1) and the performance of the global stock market, where liquidity leads the stock market by an average of eight months. 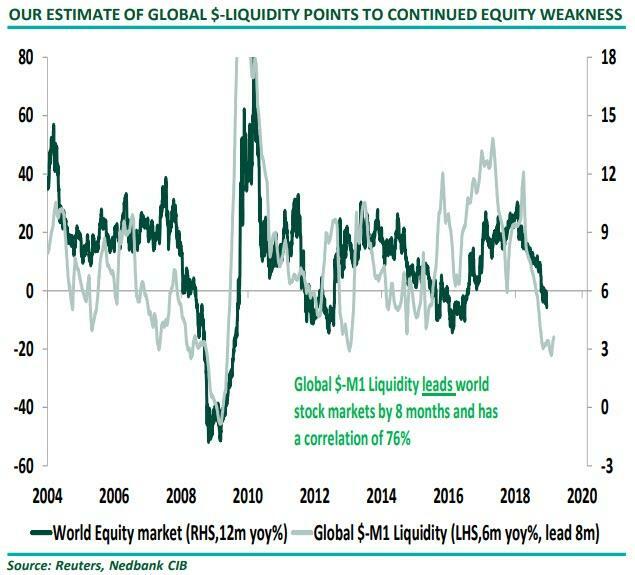 And since the rate of change in liquidity is now the lowest it has been since the financial crisis, absent a fresh boost to global $-liquidity, Nedbank expects this relationship to hold and "as a result the risk of further downside potential for stock markets across the world remains intact." 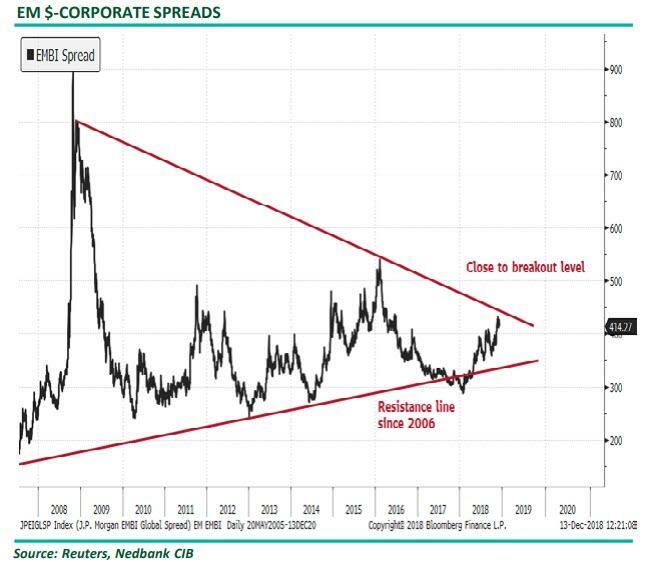 One place where the shortage of liquidity is already manifesting itself, Nedbank claims, is in the rising spread of USD-denominated Emerging Market corporate debt, where the spread is close to a breakout level. To Nedbank,"this is the "canary in a coal mine for risk assets." To be sure, the numbers are staggering and suggest a continued need for liquidity injections as USD-denominated debt of EM corporates has grown from $650Bn in 2009 to the current $3.2Trillion and, as the IMF has pointed out, there are significant mismatches i.e. USD-denominated debt as a percentage of GDP is 70% and as a percentage of reserves is 75%. Here too the picture is quite bearish, and not only from a fundamental liquidity standpoint, but from a technical one as well as the failure by markets to remain above the (red) resistance line through the tops is in itself a sell signal. 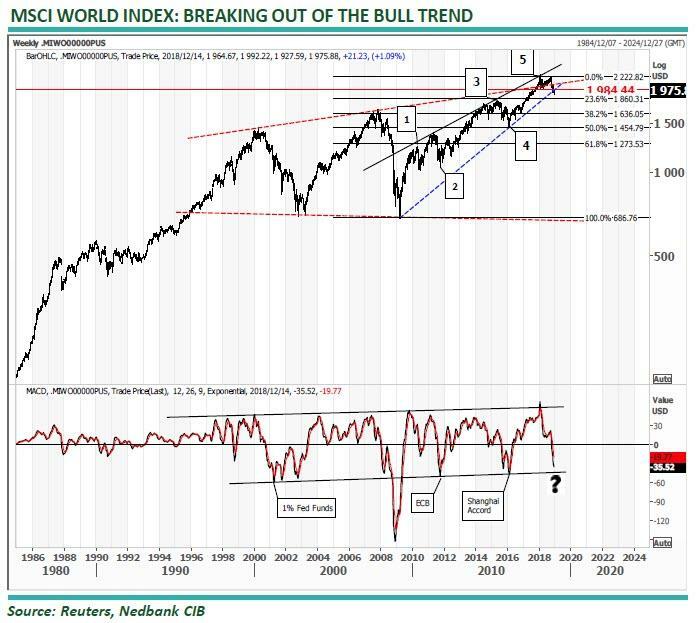 According to Nedbank, "if the world index remains below the (blue) support line at 1,984 over the coming days, it will likely be just a matter of time before the bear trend accelerates." Injecting a little more chart analysis, Daya notes that according to Elliott wave rules, the correction after the completion of a five-wave structure should retrace the entire fifth wave. This would indicate a correction to the 50% retracement level at 1,454. 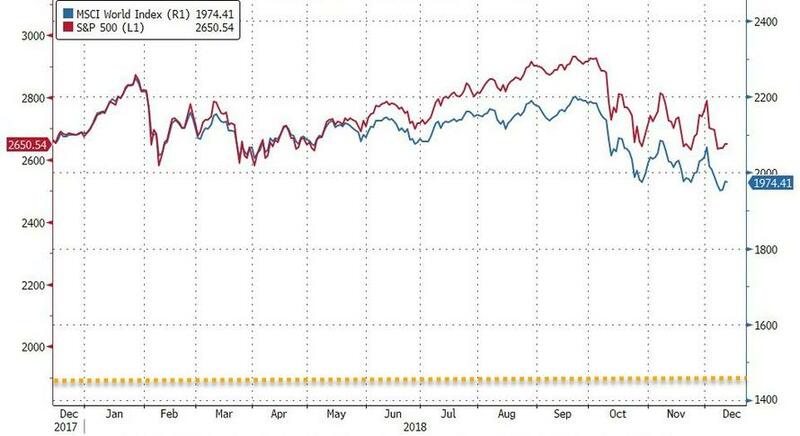 If that forecast is accurate, and if the S&P reconverges with the MSCI World, from which it decoupled for much of 2018, it would imply that the S&P500 has to drop over 700 points, sliding as low as 1900. One thing is certain: whatever the "Powell Put" is today, it will certainly be triggered should the stock market crash by that much, not only ending any Fed tightening plans, but also launching a new round of QE.